I've never been a fan of cooked salmon until I learned how to prepared it properly. You can poach, grill, or fry salmon, but my favorite method is to pan sear. Season the salmon generously with salt, pepper, or any other herbs. Then grease up a hot pan and fry salmon for 2 minutes undisturbed before turning. This will give you that beautiful sear (photographer's secret) and seals in all that flavor and keeps it moist. Finish off the rest of the cooking in the oven. Adjust cooking time your preferred degree of doneness. I prefer mine medium rare, crispy on the outside but tender and juicy on the inside. Apply cooking spray on one side of a sheet of aluminum foil large enough to fold over the entire salmon. Arrange salmon on the prepared side of the foil. Sprinkle with sage, thyme, paprika, and pepper. Fold foil over salmon to enclose. 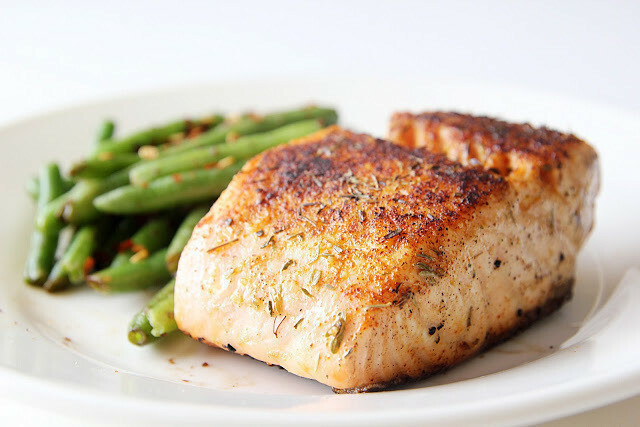 Bake salmon 20 minutes in the preheated oven, or until easily flaked with a fork. I like salmon fully cooked w/ a lemon/butter/sage etc. sauce. I always cook it for at least 30 min but sometimes it dries out and tastes gross, is that why you wrap it in the foil rather than just placing it on to bake?